Though a traditional and sometimes sustainable material that is often used in a wide variety of applications, wood has many disadvantages that can be mitigated by the selection of other materials. Wood is a plant-based material, which means that it is very sensitive to environmental conditions and wood pests. Processed wood has structural weaknesses and sensitivities that are not found in other materials. 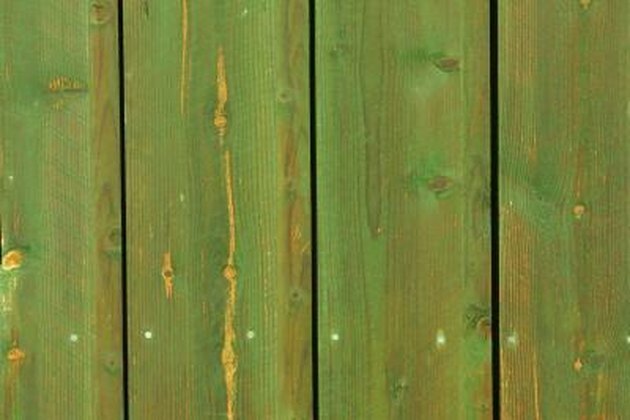 Wood used in outdoor applications can often discolor. One of the greatest disadvantages of wood is that a variety of pests are attracted to-- and can destroy-- wood. Termites, carpenter bees, carpenter ants, powderpost beetles and wood-devouring fungi are all common wood-destroying pests. These pests are difficult to identify, expensive to eradicate, and can do great amounts of damage that is virtually invisible until it's too late to repair. Some types of wood coupled with different types of wood treatments have greatly enhanced the general durability of wood, but there are many applications for which wood is unsuitable due to durability issues. In cases where material needs to withstand high weight loads, multiple impacts, extremely high or low temperatures, metals and synthetic materials are often used in place of wood. Even in the case of traditionally all-wood applications like fences, durability issues have increased the use of alternatives such as plastics, which can be formed to give the appearance of wood, but can last longer with less maintenance. Moist conditions can, over time, even soften wood treated to withstand moisture, making it susceptible to wet rot and fungus. Such problems can be very expensive to treat, and often the best preventative measure is simply to use a material that does not have this vulnerability. Plastics and nonporous materials are frequently used in applications where high moisture is a consideration. Age, temperature, and environmental humidity are all factors that can make wood warp. Depending on conditions, wood may warp by swelling, shrinking, or twisting. This means that in many fine-calculation applications -- such as in doorways and around windowframes -- the choice of wood may reduce functionality if the environmental conditions do not meet specific requirements. Wood, of course, can burn-- making it a less than ideal material to use in applications where fire safety is a concern. Even worse, some types of treated wood can emit toxic chemicals such as arsenic, which can be fatal in closed spaces. Sam Kellenberg began writing professionally in 2004. She has been published in a variety of sources from state magazines to weekly newspapers, including "Minaret" and "Georgia Magazine." Kellenberg received her Bachelor of Science in management from Berry College. How Does Polyurethane Protect Wood?